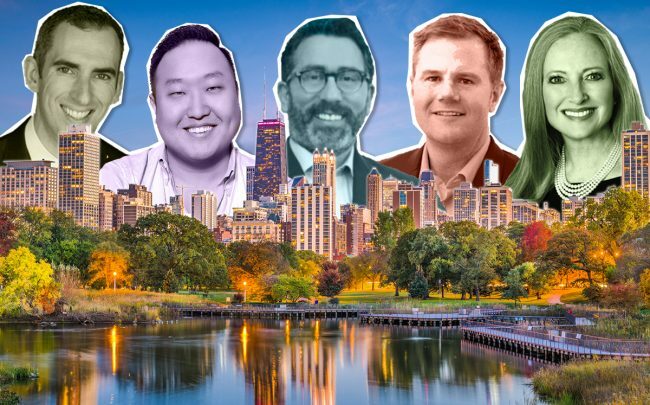 UPDATED, March 22, 3:22 p.m.: Chicago’s housing market cooldown in the second half of 2018 required some difficult conversations between brokers and their home-selling clients. That left agent Jennifer Ames sounding like a doctor delivering bad news. After a hot start to 2018 ended in a slowdown, brokers entered 2019 with a shakier housing market, a changing political landscape and increased competition among brokerages. Industry leaders have responded by investing in technology and rethinking their strategies amid the changing market realities. Collectively, the top 10 brokerages handled more than $22.7 billion in sales volume last year in Cook County alone, according to The Real Deal ‘s ranking of the area’s residential firms. 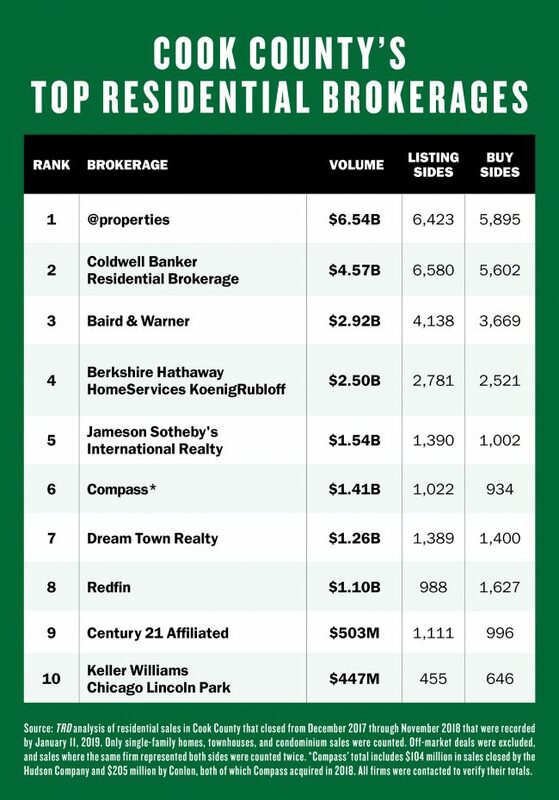 The top four firms — @properties, Coldwell Banker Residential Brokerage, Baird & Warner and Berkshire Hathaway Homeservices KoenigRubloff Realty Group — accounted for over $16.5 billion in sales. @properties and Coldwell Banker extended their dominance of the local market last year, as they together handled $11 billion in sales in the county, about half of the $22.7 billion the 10 biggest firms produced in all of 2018. @properties and Coldwell Banker ranked first and second, respectively, in virtually every segment of home sales. Those include: $1 million-plus home sales, sales under $1 million and sales of single-family homes, condos and townhomes. Only in ultra-luxury home sales of $4 million and above did another firm crack the top two, with Jameson Sotheby’s International Realty taking over for Coldwell Banker, while @properties remained in the top spot. Rankings were based on Cook County sales of single-family homes, townhomes and condos that closed from December 2017 through November 2018. No off-market deals were counted. Coldwell Banker and @properties have been jostling for top brokerage in the area for some time. In 2017, Coldwell Banker beat its local rival by about $700 million, with both firms surpassing $9 billion in sales throughout the entire Chicago market area, according to a tally by Real Trends. Last year was the first time TRD has ranked brokerages in Cook County. To go with the changing housing market, 2018 also marked a shift for the two top firms. Coldwell Banker hired new president Ayoub Rabah and absorbed the loss of top producers Ames, who went to Engel & Volkers; and Debora McKay, who moved to @properties. The founders of @properties, Thad Wong and Michael Golden, sold a portion of their firm to venture capital-firm Quad C, a move the company said would allow for investments in technology and marketing. The changes highlight the challenges facing local firms, including increasing competition for talent and the disruptive forces of technology. Addressing both will be key for continued success, said Leigh Marcus, a top producer for @properties. Last year’s housing market was running smoothly, until it wasn’t. Suddenly, a great start gave way — and quite dramatically, according to some top brokers. Sales in the Chicago market dropped by 3.7 percent last year, while prices rose by 3.2 percent. The drop in sales was felt unevenly in the market. The luxury market posted strong numbers — even if some gaudy sales masked over some uncertainty. The starter home market, however, has seen sales drop due to inventory and pricing constraints, among other factors. “It was the first time in as long as I can remember that I saw some slowing down,” Marcus said. One highlight of the year could be the ultra-luxury market, which set a new record for $4-million-plus home sales in the area. High-end home sales were bolstered by the popularity of Gold Coast condo tower No. 9 Walton, which had three of the top 10 priciest residential sales of last year and recorded the priciest home sale in Illinois history in late 2017. Sales in the newly delivered tower even propelled its listing agent, Nancy Tassone of Jameson Sotheby’s, to the top position in Chicago Agent’s top broker rankings by volume. She had never appeared in the top 20 since at least 2011, when Chicago Agent began its rankings. But No. 9 Walton’s success masked problems with the luxury market, like an abundance of inventory, softening prices and a slew of progressive tax proposals that could further dampen the outlook. “No. 9 Walton was an entire dynamic in itself,” said Jeff Lowe, a broker with Compass and one of the top producing agents in the city. The industry also is seeing a slew of new companies vying for a piece of the pie. One of the year’s biggest industry stories was the arrival of Compass to the market. In early 2019, Ames opened the first Engel & Volkers outpost locally and has plans to expand. Then there’s the increased presence of Redfin and other online giants, some of whom are working to remove agents from the home-buying equation. “I’ve never seen a competitive landscape like the one were dealing with today,” said Laura Ellis, president of residential sales for Baird & Warner, which ranked third in TRD‘s residential brokerage ranking. Compass, which entered the Chicago market in November 2017, ranked sixth with $1.4 billion in sales in Cook County. That includes about $309 million in deals closed by Hudson Company and Conlon before Compass acquired them. Compass’ entrance also helped some top agents secure better deals to stay with their brokerages, experts said. And, if nothing else, it shows Chicago’s housing market is appealing to outsiders. “I think there’s plenty of business to go around,” Greco said. Brokerages still managed to succeed despite all the challenges. Lowe was one of the few Top-10 brokers who saw year-over-year increases in sales volume last year, according to Chicago Agent’s rankings. He chalked up his success to being realistic with listing prices, plus a little extra effort. Buyers are more empowered in a soft market, and sellers have yet to come to terms with what that means for asking prices and time on market, multiple brokers said. “Buyers see prices at their peak, and sellers don’t see it there,” Greco said. That reality requires brokers to bridge the gap. For clients who don’t want to move down on price, staging and marketing were key. It isn’t just economics guiding the trend: Buyer preferences are changing away from the fixer-upper and more toward what looks good on Redfin and even Instagram, Marcus said. Correction: A previous version of this story incorrectly stated Debora McKay’s new firm.